Fireworks blaze over the skies of American cities in the annual Independence Day celebrations. But nearly 12.5 million light-years away in the dwarf galaxy NGC 4449 stellar "fireworks" are going off all the time. Hundreds of thousands of vibrant blue and red stars blaze in this image taken by NASA's Hubble Space Telescope. Hot bluish-white clusters of massive stars are scattered throughout the galaxy, interspersed with numerous dustier, reddish regions of current star formation. Massive dark clouds of gas and dust are silhouetted against the starlight. NGC 4449 has been forming stars for several billion years, but currently it is experiencing a star formation event at a much higher rate than in the past. This unusually explosive and intense star formation activity qualifies as a starburst. At the current rate, the gas supply that feeds the stellar production would only last for another billion years or so. Starbursts usually occur in the central regions of galaxies, but NGC 4449 has more widespread star formation activity, since the very youngest stars are observed both in the nucleus and in streams surrounding the galaxy. A "global" starburst like NGC 4449 resembles primordial star forming galaxies, which grew by merging with and accreting smaller stellar systems. Since NGC 4449 is close enough to be observed in great detail, it is the ideal laboratory for the investigation of what may have occurred during galactic formation and evolution in the early universe. 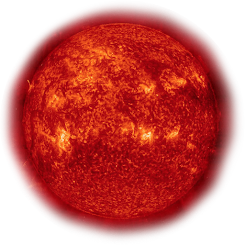 It's likely that the current widespread starburst was triggered by interaction or merging with a smaller companion. 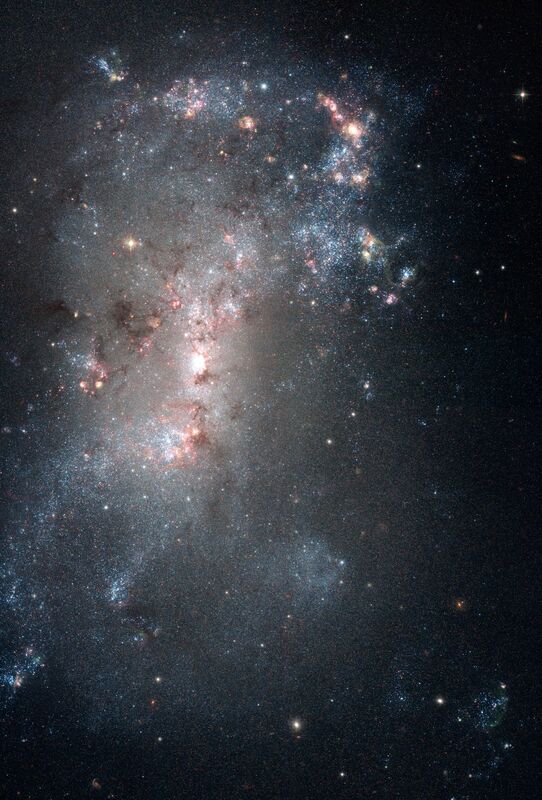 NGC 4449 belongs to a group of galaxies in the constellation Canes Venatici. Astronomers think that NGC 4449's star formation has been influenced by interactions with several of its neighbors.